Upcoming Tournaments : Squad – Communicate. Coordinate. Conquer. 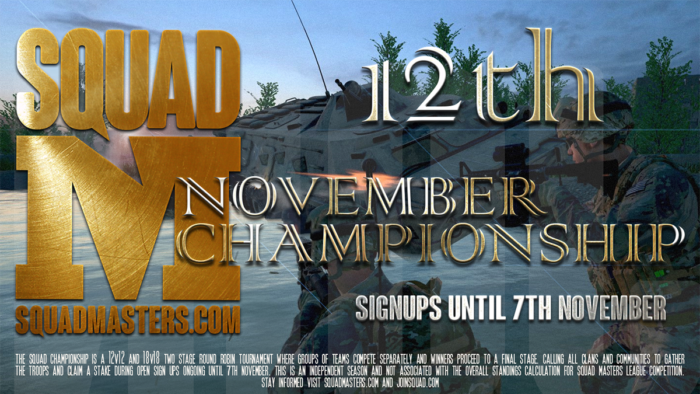 Saturday, November 12th kicks off two separate hybrid round robin tournaments. Theres a 12 man league and an 18 man league, where winners in a qualifying round robin stage proceed to a single elimination second stage and then the championship final. In the first stage, groups of four teams compete seperately and winners proceed to the second stage. The top two participants are saved from each group, and when teams are tied theyre ranked by the number of wins each had against the others. The second stage is a single elimination tournament. So gather your troops and get your clan ready – registration is open until November 7th! Registration, rules, and more information can be found here. Squad Frontlines is a brand new free tournament based around Squad. Unlike any other clan ladder or online tournament, anybody can join and players participate in a simulated war called a campaign. Campaigns stretch over the course of several months with weekly battles. The tournament includes commanding officers, divisions, and a grand battle map on the front page showing the progress of the war from week to week. Divisions are self governed and members can climb their way to the top to command their own company of soldiers or even become a general! Squad Frontlines is built on a foundation of leadership, dedication and organization. Team play is the rule, not the exception. Every soldier in the tournaments participate in making their division a well-oiled machine making their weekly battles some of the most intense and rewarding ways that Squad can be played. Registration for Squad Frontlines will be live very soon, with weekly battles starting soon after on Saturdays! Rules and more information can be found here. Between the November Championship with Squad Masters and the launch of Squad Frontlines, next month will have a lot going on! Both of these events are operated independently outside of Squad and Offworld Industries, but we love the enthusiasm and the opportunity to play the game in different ways. Enjoy the tournaments!